Direct-to-consumer online sales have accelerated bankruptcy risk for some retailers, particularly ones that have been slow to shut down underperforming brick and mortar locations. Retail suppliers and other stakeholders have been closely monitoring this tepid operating environment over the last few years, but it seems that trouble is developing. Sears Holdings (NASDAQ: SHLD) and Claire’s Stores are two names that CreditRiskMonitor’s proprietary FRISK® score has highlighted to watch closely through what is considered the most important retail period of the year, the holiday season. One of the key components of the FRISK® score is the crowd-sourced, aggregate usage data of CreditRiskMonitor subscribers. These financial risk professionals make decisions for more than 35% of the Fortune 1000 and over 1,000 other large corporations internationally. Trade credit represents the third largest source of debt financing in the corporate world. So, how risk managers interpret a business’s financial health ultimately impacts the availability of working capital. This crowd-sourced data cannot be found anywhere else and adds accuracy to the FRISK® ranking that goes well beyond simply looking at financial reports and payment histories. A retailer’s risk of bankruptcy is important given that all counterparties are constantly making decisions on whether to do business with them and on what terms. For instance, a supplier may be faced with a tough decision of determining whether to supply inventory and extend credit to a struggling department store. For a real time case, we can briefly contrast the two renowned brand names of JC Penney (NYSE: JCP) and Kmart. While both possess fairly weak financial profiles, there is a clear distinction between the two. Notice that we did not include JC Penney in the list above as it holds a FRISK® score of 3. This rating is far from healthy, but it’s certainly much better than Sears’ rating of 1 (Sears is the parent of Kmart). 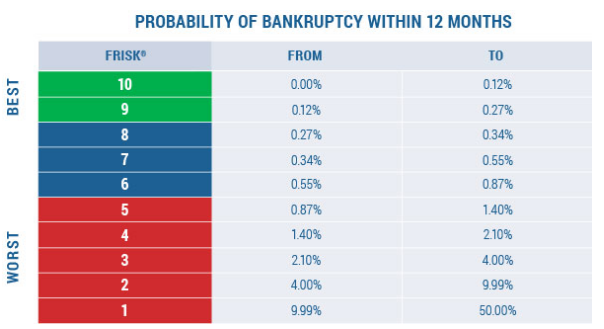 That difference represents a huge separation for implicit risk, where JC Penney yields a modest 3% probability of bankruptcy and Sears pushes into the range of 30%! Jakks Pacific (NASDAQ: JAKK), the fifth largest toy manufacturer in the industry, recently made just such a tough call, stating that it had suspended shipments to a large retailer, which was identified to The Wall Street Journal as Kmart by unnamed sources within the company. Clearly this was a very difficult choice, but more importantly, it suggests that the supply chain audience has a deepening concern about Kmart’s ability to pay its suppliers. That being said, let’s dig into what may have led to that decision using the tools available to CreditRiskMonitor subscribers. As of the second quarter, the company held $276 million in cash and $390 million in trade receivables which can be appraised very close to face value. The roughly $4.7 billion worth of inventory however, simple retail merchandise, could very well sell for cents on the dollar during liquidation. If we conservatively hold current liabilities constant and assume that inventory isn’t worth what is listed on the balance sheet, the business could easily run a working capital deficit. It’s also worth noting that short term debt increased from $446 million to $714 million. This is something that we look for that may signal increasing near-term distress. The jump is typically due to a debt conversion, which either can develop naturally, simply due to maturity, or from a covenant trigger – which is a much more concerning event. Given that the company is reporting steeper losses, increasing from $802 million to $1.9 billion over the last twelve months, it’s probably safest to view this short-term debt change with a skeptical eye. In short, using CreditRiskMonitor’s database tools, you can see why Jakks Pacific might be reluctant to expose itself to a segment of Sears Holdings. Claire’s Stores is another example worth diving into. In 2013 the retailer’s gross margins declined from 47% to 45%, swinging a modestly profitable business into a very unstable one. The company’s public debt has been rated below investment grade by the major credit rating agencies for many years. But how much risk is there right now? It’s also worth highlighting that the retailer’s senior debt securities run at interest rates of 7-10% per annum. We can presume that if the business were to fall into distress, those subordinate to the debt structure would potentially take a haircut or be wiped out. This holiday season will prove to be pivotal for many retailers navigating today’s tough environment and some companies may have reached the point of no return. Jakks Pacific is just one example of a business that cut ties with a retailer to, in its view, preserve its own credit portfolio. Claire’s is another difficult case worth watching closely. In fact, the nine businesses mentioned above all have different stories, but each follows a similar theme: rising financial risks heading into the most important sales period of the year. Financial counterparties should keep a close eye on all of them.